One of my roles at The Climate Corp., an Ag-tech company, was to lead their research practice. The product development organizations had created a product that met the needs of a few early adopters. Now, we wanted to start scaling the product to a larger audience. Knowing the success of my role at Climate would hinge on this business need, I set out to do what I do best - learn about people and figure out how to enable them. I worked with a sales lead and a product owner to define a mix of customers based on their operation and acreage size, to find research participants. I then headed out to conduct contextual inquiries. I rode along in planters, scouted fields at 5 am, and harvest beans late into the night. I learned more than I could ever imagine about the agricultural industry, farmers, and their families. I brought this knowledge back with me into the design team’s fish-bowl conference room in SF. I covered the wall with sticky notes. I organized the information in vertical lines that represented phases, tasks, and challenges farmers and their families were facing. Underneath, I drew a big blue line. The line represented the divide between our products and our farmer’s needs. Underneath that line, I added features and functionality of our products that met the needs of the folks who might use our products in the future. I brought in product and sales leadership to ‘walk the wall’ with me, sharing stories and identifying gaps. With these insights, we were able to see the practical solutions that the majority of our users needed. Using these insights, I created a set of Personas and Journey Maps that described our audiences and their operations. 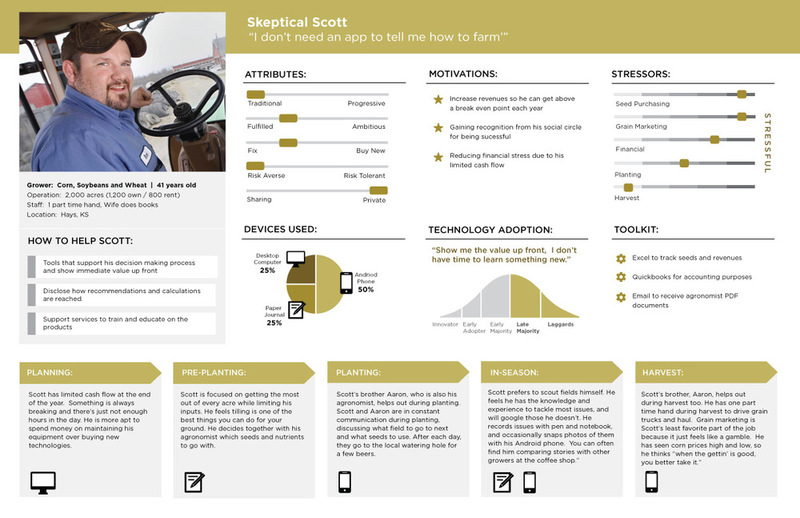 I leveraged these Personas and Journey Maps in road mapping and prioritization exercises that generated the product strategy and direction for solutions like the Field Health Advisor, which enabled farmers to see troublesome spots of land miles away from their phone or iPad, and the Harvest Advisor that allowed farmers to know which field to harvest first. While I continued to facilitate conversations and workshops with the product, tech, and design leadership to help distribute this knowledge, I also had the opportunity to design the experience for Field Health Advisor and Harvest Advisor.